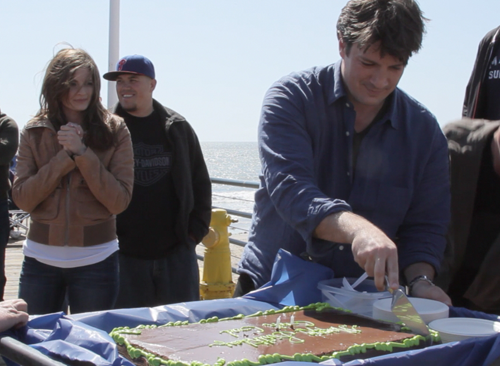 Nathan cutting his birthday's cake and Stana watching behind.. . Wallpaper and background images in the Nathan Fillion & Stana Katic club tagged: nathan fillion stana katic stanathan. This Nathan Fillion & Stana Katic photo contains 점심, dejeuner, 점심 식사, 오찬, 티핀, 데저 너, 이탈리아 식, 전채 요리, and 곁들여진. There might also be 공식 만찬, 저녁 식사, 식사, 식료품, 오르되브르, and 전채 요리. I don't know what's going on this week but I'm totally love it!